Lindsay Lohan can't stop eating now that the Betty Ford Center has cut off her Adderal supply. With no diet drug Adderall at rehab LINDSAY LOHAN is reportedly chowing down like there’s no tomorrow. Since Lindsay Lohan‘s Adderall was taken away from her last week by doctors at the Betty Ford Clinic, the troubled actress has gained five pounds and is complaining that she can’t stop eating, RadarOnline reported. The 26-year-old starlet has been “extremely emotional this past week and is finding comfort in food. Lindsay can’t stop eating, and has gained five pounds because she has such poor eating habits. She has been exercising, but she just doesn’t have a lot of energy because she is no longer taking Adderall, which is a psychostimulant medication that contains amphetamine. She has been talking to a nutritionist at Betty Ford about eating healthier,” a source said. 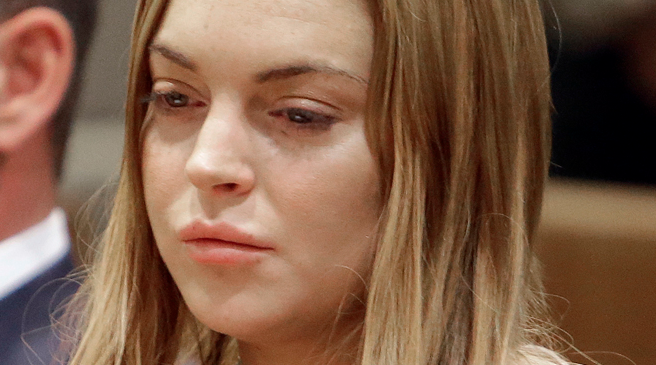 LiLo first revealed her Adderall use in a interview saying, “I have severe ADD (Attention Deficit Disorder). I can’t stand still. So I take Adderall (a prescription drug) for that, it calms me. I know people who take it to stay up, or girls who take it to supposedly stay slim because it kills your appetite. Stop hating on Lindsay eating and gaining a few pounds while shes on lockdown... hell her lil stick figure self NEEDS to gain some weight!! If you can see your clavicle and count all of your ribs im sorry but you need NOURISHMENT!!! Skinny is cute but there is a difference between cute skinny and SICKLY skinny just like there is a thin line betwix'd cute thick and OMGwhydoesurfatasshaveonthoseleggingslookinglikeawetsackoflaundryTHICK LEARN ABOUT IT!!! naw skinny ain't cute. Nothing cute about looking like a number two pencil. Give me curves any day. Real women have curves. Everyone has their own preferences.. I personally think only a dog wants a bag of bones but i digress... Tomato Tomatoe... Eat your heart out LiLo, a few pounds might look GOOD on you!!!! !